A socket provides send and receive over TCP and a StreamSocketListener will listen for incoming TCP connections. The sample will act as a server or client depending on which buttons you press, i.e. press listen to be a server and connect to be a client. Also, you can set the same program as client and server ad have it communicate with itself. It uses a DataReader to read from the incoming socket and then calls itself to wait for subsequent incoming message data. // change the rest acccordingly…. Note that setting the InputStreamOptions to Partial will allow you to specify a larger buffer but also the async load operation will complete when a smaller sized buffer comes in. This enables you to read the data coming in and respond to it accordingly. 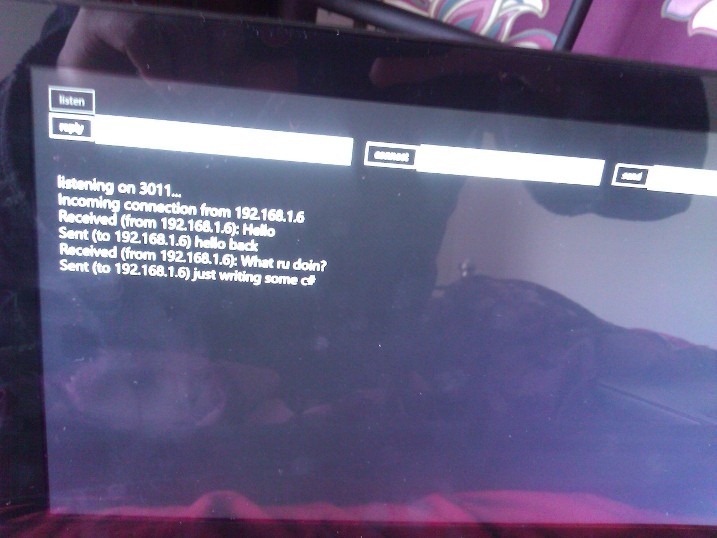 The pictures show a session between a socket server running on a build slate and a win8 vm both on my local network.. The project can be downloaded from here. Thank you! I was having trouble reading input from a StreamSocket until I saw how you were using InputStreamOptions.Partial. My problem was that I was trying to read a smaller input with too large of a buffer, so it was hanging indefinitely. I’ve been having trouble with a project i’m working on. It throws a datareader/datawriter error saying “the object is closed.”. I downloaded your project and ran it and am receiving the same error. Do you know anything about this? Any suggestions? This may be misunderstanding StreamSockets, but this is all well and good – and I have your sample running, however the chat client and server are within the one application? Wouldn’t I need to host the ‘server’ component on a server somewhere on a windows service or something? I try to implement the server code on any other project type, WPF, console app etc. and I can’t find Windows.Networking namespace. Now I’m really confused, I wouldn’t want the server to be another Windows Store app? Hope you can shed some light on this! Ah, awesome. That makes sense, thanks. I’ve also since been looking at trying to use it with the Microsoft.WebSockets NuGet package too. Will take a look at your WPF client, thanks. Is it necessary to send/recv the size of the message? I’m trying to get the listener to work with a telnet client and its giving a bit of trouble. I’m trying to make a simple test server using StreamSocketListener that I can telnet to. For some reason the telnet client cannot connect to it. Netstat shows there is a tcp connection listening on the port I chose. Any idea? Have you by chance used the listener and connected a telnet client to it? I’ve done this before using .net tcplistener w/o issue. I separated the code into client/server but i could not get it to work. When i was trying to connect from client to my already running server i was getting an error(due to time out i suspect my server was unreachable) .I tried localhost and ip and different ports but i had no luck any ideas on what i may be missing? Does this example still exist somewhere? I’m looking for an example of a StreamSocket that is receiving on the client side. Yes, are the links not working for you? Link wasn’t working when I posted but it appears to be back now. Weird.